(AP)—EBay's PayPal unit is planning layoffs in the coming weeks as it tries to refocus and operate more like an agile startup than a large company, according to people familiar with the matter. These people spoke on the condition of anonymity because they were not authorized to discuss the layoffs. Bloomberg reported on Friday that the cuts could affect as many as 400 jobs. PayPal has nearly 13,000 employees. In a statement, PayPal said it has told employees about plans to "strengthen and simplify" how it creates and delivers products. It said it has not yet discussed how these plans might affect jobs and did not confirm or deny the possible layoffs. Nonetheless, a person familiar with the matter said that PayPal employees were told a few weeks ago that there would be a "reduction in workforce." The person did not know how many jobs would be cut. In a memo to staff sent on Friday, PayPal President David Marcus told employees they may hear "rumors floating around about layoffs." "What's not a rumor is that we are committed to changing the way we build products and becoming a simple, customer-focused company. We haven't changed course on our vision, but as you know and have been advised, we need to change our approach to how we will get it done," Marcus wrote in the memo obtained by The Associated Press. Marcus took PayPal's helm in April. He joined the company when eBay acquired his startup, mobile payments provider Zong, in August. EBay CEO John Donahoe said at the time that Marcus brings "startup energy" to PayPal. 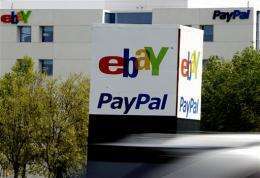 ThinkEquity analyst Ronald Josey said the possible layoffs are not an indication of a weakness in PayPal or across eBay as a whole. "Rather, we view it as part of relatively new President Marcus' overall review of PayPal and his focus on returning the division to a more startup like and nimble environment within eBay," The analyst wrote in a note to investors. On Monday PayPal also unveiled a marketing campaign aimed at positioning itself as a customer-focused company that provides more than mobile wallet technology. It hired the actor Jeff Goldblum ("The Big Chill" and other films) to chat up PayPal as an all-purpose payments service in a series of online videos. The moves come as PayPal faces increasing competition in the world of online and offline payments services from the same types of startups that Marcus is trying to emulate.